The condominium, still under construction, is known as The One and being worked on Foster & Partners, a frequent Apple architectural partner, MacRumors noted. Blueprints point to a 9,000-square-foot store that may have a balcony level similar to Apple Union Square in San Francisco. The documents were first submitted in March 2016, but only later updated to mention Apple by name. The company could still theoretically pull out of any deal —if so it would lose prime downtown real estate, located next to other shops and potentially connected to PATH, the city's underground tunnel system. Apple currently has four stores in Toronto: Eaton Centre, Fairview Mall, Sherway Gardens, and Yorkdale. A Yonge and Bloor location might better capture downtown traffic, especially since it would attract passers by. 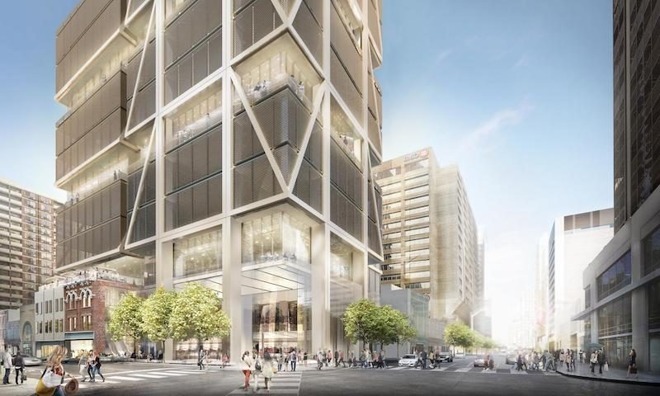 Update: MacRumors has updated its story to say the condominium will be 85 stories, not 82, and that the Apple store will occupy only 9,000 square feet instead of 19,000.